Every year a class constitution is created to support a purposeful and safe environment in the students classroom. Each class develops an individualized constitution based on the philosophy of being safe, responsible and respectful. After the development of the constitution, all students sign the document and make a commitment to follow the expectations created by the class. I am committed to school wide reading for students and believe that every student can learn to enjoy reading if given the right opportunity. Because of this commitment, I have developed a reading corner in my classroom. 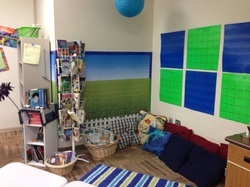 This reading corner has books displayed for students, an easy check out system and several pillows for students to use. 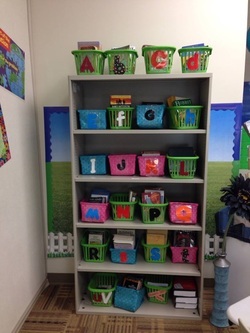 This is a great way to encourage reading and is a comfortable place for students to use in class. Also, I use formative assessments on a regular basis to guide and adjust my instruction. To make this process easier and more seamless, I create a formative assessment grid for each period. Students are given exit slips at the end of the class to complete on sticky notes and then they place the responses on the grid. I can then go through and quickly see who is understanding the material, who needs additional support, and who needs a push in instruction. 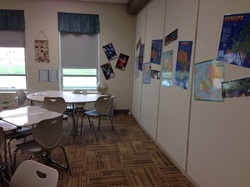 I use pods in my classroom to encourage productive group work and collaboration. Each pod has a materials bin that can be filled for different purposes. Also, when we use different texts or materials I provide each pod the materials needed to be successful. 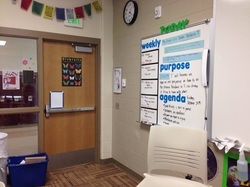 These pods allow for students to engage in conversations about the material we are learning about in class, and allow for teachable moments on how to work with groups and have quality discussions with one another. After several years of professional development on instructional practices, I developed a wall at the entrance of my classroom that promotes a better understanding of everything that goes on in class. The most important piece of this entrance board is the purpose statement. Every day I establish the purpose for the students so that they understand exactly what they are supposed to be learning for that day. I always use a content purpose, but will also include a social goal and language goal for the day, when appropriate. I also make sure to include the specific standard that is being addressed for the week or unit. By including the standards that are being used, students are able to see how the daily purpose aligns with the larger goal of meeting specific standards in class. I have a library of books in my room and make sure to include a variety of leveled texts to meet the diverse needs of students when it comes to reading. I also organize my books so that they are in bins facing forward. I have organized them by alphabetical order, and also have organized them by genre. This allows students to have easier access to books in my classroom and promotes the school wide reading program that my school adopted. I have a kidney table in the back of my room that I use on a regular basis for flexible grouping in class. Each flexible group is based on formative assessments in class, and having the kidney table allows me to work with these small groups to ensure all students understand the material needed.